In a bid to resolve regulatory hurdles that hinder the operations of taxi aggregators in India, the ministry of road transport and highways has called a meeting with the representatives of companies such as Ola, Uber and a clutch of smaller startups. The meeting has been convened on Thursday in New Delhi, the founder of a startup who has been invited told Techcircle. Along with Ola and Uber, the largest cab-hailing operators in the country, bike-taxi startups including Baxi, Rapido and NOW, too, have got the invitation to the meeting, another invitee said. The ministry, according to the person mentioned above, has asked the startups to present a list of challenges they face as well as their wish list. Each company will get around 15-20 minutes for making its presentation, the people mentioned above said. TechCircle couldn't immediately ascertain whether the minister of road transport and highways Nitin Jairam Gadkari would be presiding over the meeting. The meeting is considered to be a precursor to the government's efforts to come up with certain guidelines to regulate the evolving transport aggregation industry in the country. Interestingly, earlier this month, Gadkari had, from a public platform, spoken of the plight of unorganized auto-rickshaw and taxi operators. "Their unions keep meeting me to complain that cab aggregators are killing their business," the minister had reportedly said. Local taxi operators have protested against taxi aggregators in Mumbai and Delhi quite often in the past. At the same time, aggregators have faced regulatory setbacks over issues such as licensing, pricing and even safety. The global taxi business is pegged at $100 billion a year, and according to financial services firm Morgan Stanley, ride-hailing apps will account for 25% of all road transport by 2030 against their current share of just 4%. 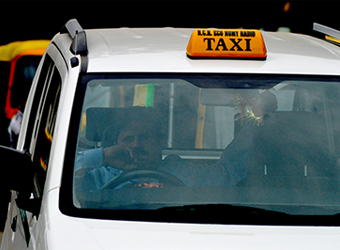 Currently, there aren't any clear policies governing the cab aggregators in the country. For instance, when Uber and Ola launched bike taxi services in Bengaluru, the state government cracked down on the two companies on the ground that as per the Motor Vehicles Act, 1988, enforced in Karnataka, a two-wheeler is considered to be private transport and that bike taxis need to be licensed for commercial use. Interestingly, the two companies continue to run the same service in other states. Ola, for instance, runs Ola-bike in Gurgaon in the National Capital Territory while Uber runs its bike taxi service under UberMOTO brand name in Gurgaon and Ahmedabad. Bangalore- based bike-taxi operator Hey Bob had to shut operations recently due to fund crunch and lack of clarity in regulations keeping out investors. India is one of the world's largest two-wheeler markets and the on-demand bike and taxi segment has exploded over the past year. As many as 40 app-based companies are estimated to have started operations in various cities. Bengaluru-based Rapido raised an undisclosed amount in a pre-Series A round of funding from investors including Hero MotoCorp Ltd chairman Pawan Munjal and Google India managing director Rajan Anandan in April. Baxi had raised $1.4 million last year in seed funding from a group of affluent individuals.